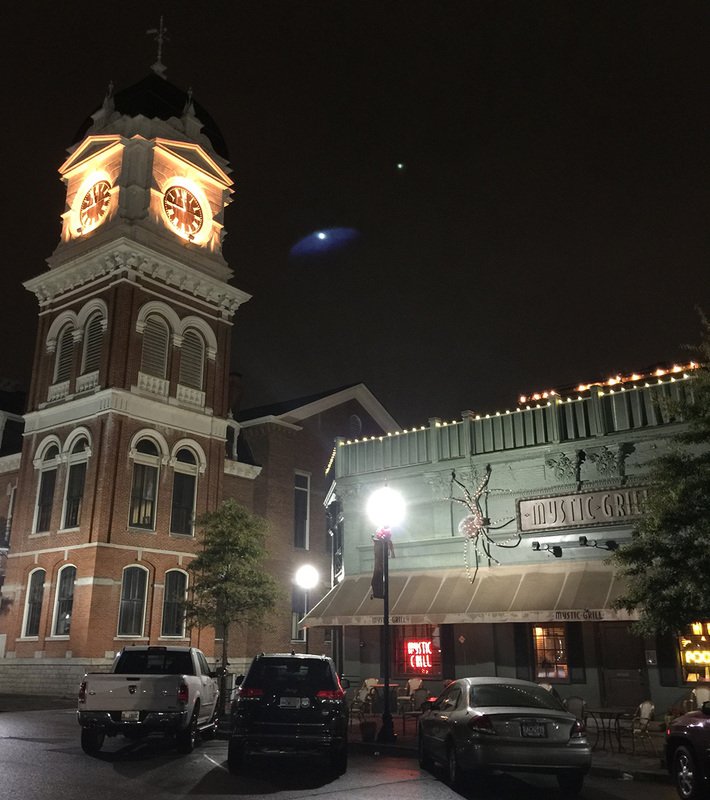 On the same town square the TV series Heat of the Night was filmed, lies the Mystic Grill which was featured in the television show Vampire Diaries. While vampires no longer lurk in Covington, the food is bloody good and is one of the best restaurants we’ve ever visited OTP. It was a misty, creepy night when we arrived at Mystic Grill. I am rarely so optimistic simply from a web visit but I thought their website is dynamite. We learned about them from a TV ad that’s something similar to this video I found on Newton Federal’s Facebook page. 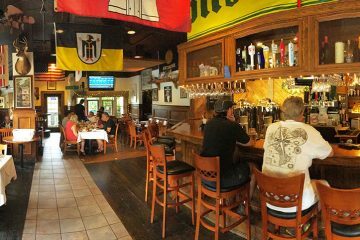 Yes, it’s sometimes crazy how restaurants seem to pop into our minds but I liked the way Mystic Grill looked like on the video and wanted to check them out. When we pulled up, Laurie mentioned that she had been there before with other family members and commented on how good it was. I was unable to locate parking on the square (that’s a good sign to me) so I dropped the girls off and parked around back. When I got into the restaurant, I found Melanie and Laurie already seated. We met our server and soon has refreshments. 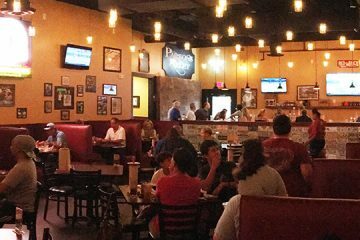 The staff was very friendly and took the extra time that we always need because of our many menu questions that we enjoy peppering the staff with. Once Laurie’s eyes locked on the Pimento Cheese appetizer, the decision had been made about our starter. But before our appetizer could be served, the bread service arrived. I’m not sure whether we’re just on a crazy bread service streak but I hope it continues. 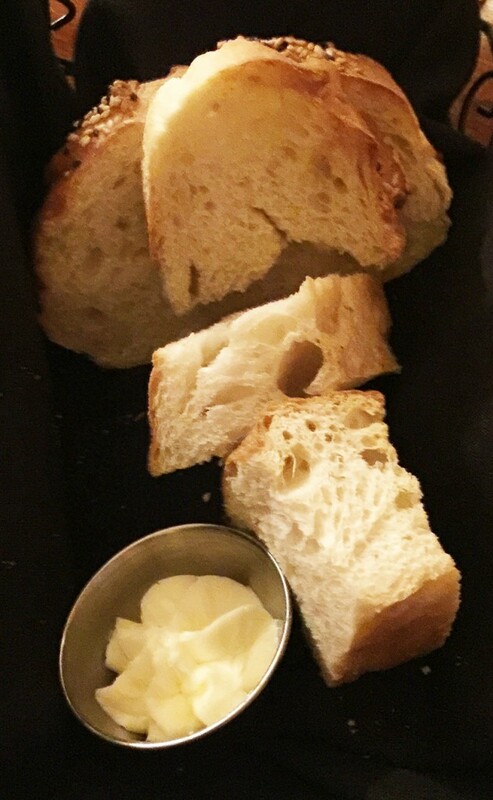 The bread was warm, the butter was soft and creamy and it was a delicious beginning to our meal. 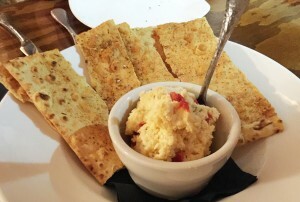 The Pimento Cheese arrived soon after and we were surprised by the homemade Lavosh. Ever since our visit with Angie Tillman at Phickles, we’ve been on a pimento cheese craze. The appetizer was tasty and we loved the lavosh because this is so rare and it made it such a treat. If you haven’t had lavosh before, it’s kind of like a pita bread cracker. It’s thick and perfect for the heavy pimento cheese. 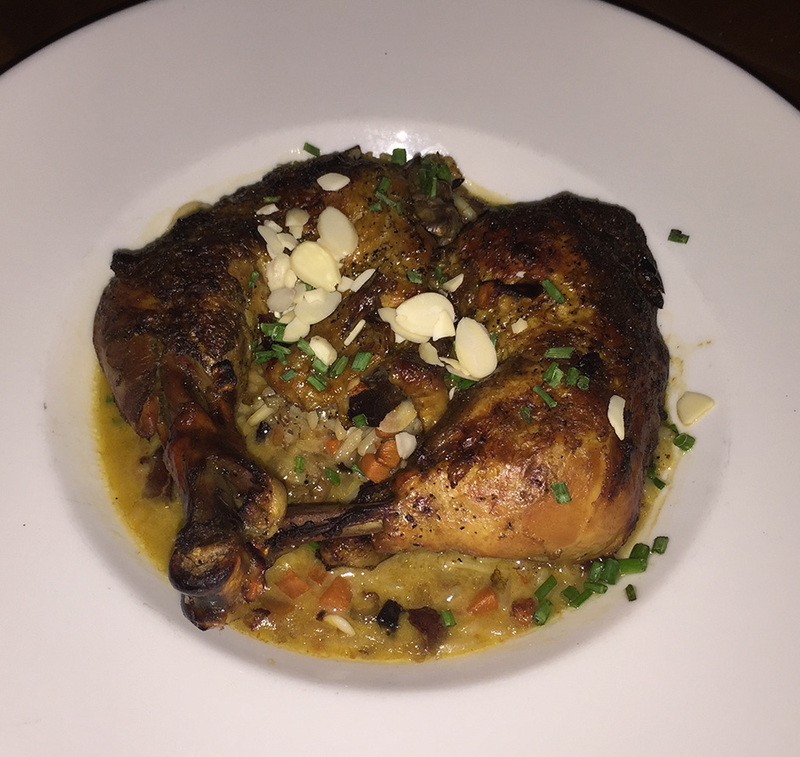 Laurie ordered the Country Captain Chicken that is baked chicken quarters served over white rice in a curry broth with smoked bacon, carrots, onions and peppers. It’s topped with raisins and shaved almonds. It’s to die for . The chicken is so juicy, it’s really incredible. The vegetables mixed with the chicken and curry broth really sets it off. Melanie went for the Fried Chicken and got the Buttermilk Mash (mashed potatoes) and Bacon-Braised Greens. She thought the fried chicken was wonderful and particularly enjoyed the way everything was seasoned and didn’t require any additional. We then had a discussion on how much better food tastes when the seasonings are cooked into the dish. Merely topping food off with salt and pepper is such a poor substitute for properly seasoned food. 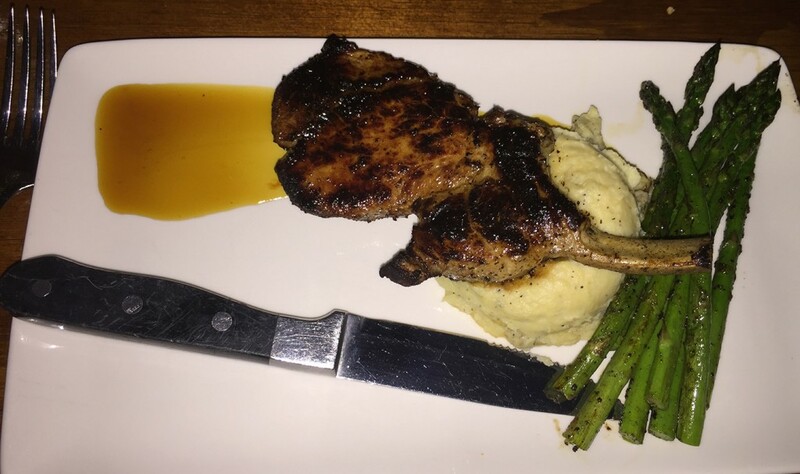 I went for something completely off of my normal radar and ordered the Bourbon Glazed Pork Chop with the Buttermilk Mash and Grilled Asparagus. I seldom eat pork other than barbecue, but this was fantastic. You could really taste the bourbon in the glaze and it was such a delight in contrast to the meat. As Melanie had commented, the flavor of the seasoning cooked into the meal was just captivating. Readers, culinary excellence can be found OTP. Venture outside the box and make your way to the Mystic Grill. The ambience is excellent, the food is stunning and the service is awesome. We had a great time and plan to return often. It’s on our list of MUST EAT at places in Atlanta. Guten appetit! 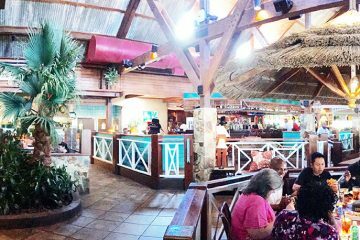 We always enjoy taking friend and relatives to eat with us at The Mystic Grill. The O’Hara Burger is amazing. It has an Angus beef patty, tomato jam, a fried green tomato and pimento cheese on it. Everything we’ve ever eaten there has been excellent. Charlie, I’m going to need to try the burger next time we’re there. Sounds dynamite! Thanks for the comment! The fried meat loaf is amazing! 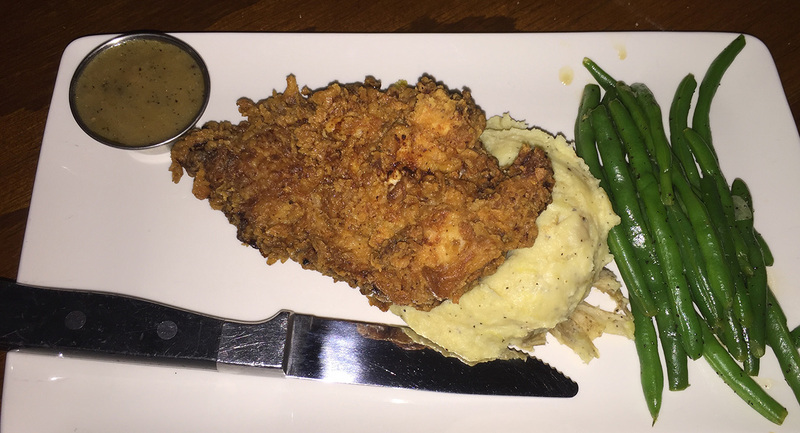 I also loved the sweat tea fried chicken. Would go there all the time if I lived closer. The ribeye steak with the garlic mash and brazed greens with the red wine demi glaze is melt in your mouth delish! I have never been to a NON steakhouse and had such a WONDERFUL steak. I have been to other “steakhouses” and had horrible steaks. However the meat is cooked to sheer perfection every single time. My husband also enjoys getting the peach jalapeño butter on his steak for the added kick. I hope they are around forever. Thanks for the comment Amanda! The food at Mystic is fabulous and very creative. We really enjoy it every time we go, which is often. The Chef is fantastic. 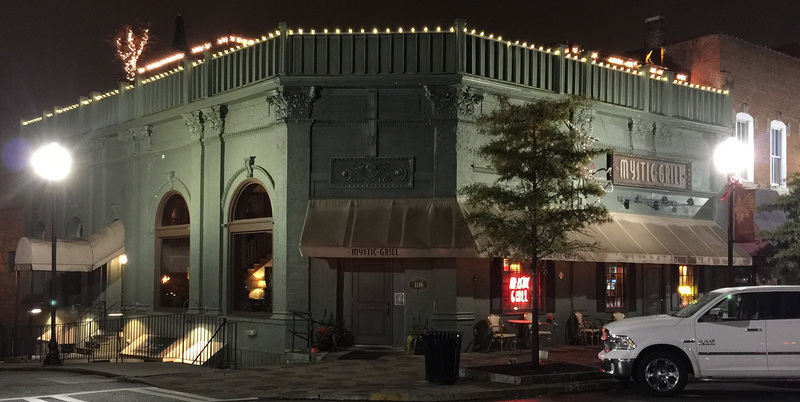 Mystic Grill is a a wonderful asset to the city of Covington. I agree 100% with you Darcel! Taken to Mystic Grill for the first time on Mother’s Day this year. The food was wonderful! The staff great! and the extra touches for Mother’s Day were wonderful! Thanks for the comment, Carol! I’m so sorry but you must have eaten at a different restaurant than I did that evening. I have eaten there on 4 separate occasions and every one of them left much to be desired. Overpriced, greasy food and mediocre service each and every time I went! So either they knew you were a critic and made the adjustments necessary to score this stellar review (standards that should have been implemented as every day practice for the locals), or perhaps they have new owners (which I know is not the case). Perhaps this was on a “good” night. The reviews I read on Yelp are all over the place. Anyway, glad that you had a great meal! Wish I could’ve had such an experience the last 4 times I went! 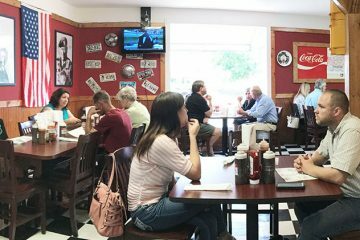 Brittany, one of the things we try to do is to make sure that we try to get the same experience as any other diner. Of the vast overwhelming number of positive comments we gotten, we have gotten a few negatives such as yours. We are going to keep continuing to return to this restaurant to try to sort this out. Thank you for your comment! Sounds like you had a good experience. Who is the chef? Great question Jim! I searched over their website but couldn’t find anything. I’ll have to do some more research and get back with you. I’ve dined in once and take out for lunch. Both times the service and the food was amazing. The shrimp and grits are the best I’ve ever had. Mystic will be a favorite of mine since I work really close. Also I’m not the easiest person to please when it comes to my food but this place is a gem. Thanks for the comment, Gege! We have only been there one time and intend to go back. I love a good Filet Mignon and theirs was the best I’ve ever had. It was so tender and full of flavor. When I go out to eat, I want an experience and food I can’t make at home. As a professional cook, the mystic grill doesn’t offer that. I tried it upon rave reviews and was left wanting. Even in your pictures you can tell that sides are an after thought. I have been to places where they put as much thought into their sides as they do their mains. While the food is decent, it is nothing to write home about in my eyes. Great comment Frank. Thank you! I spent a loving evening at Mystic Grill in October. I enjoyed the generous Charcuterie Plate with my guests. I agree with you on the great bread. Also tried the Wedge Salad. Delicious and presented in an inventive way. BTW the service was flawless and the specialty drinks perfect. I will be back! Thanks for your comment, Rebecca! How in the world did we miss the Charcuterie Plate? Thank you, Frank, spot on. Their hamburgers and fries are also to die for. Love the place. I live in covington and have been a few times and i agree on the service being great and the food delish!! Never have i had an issue! 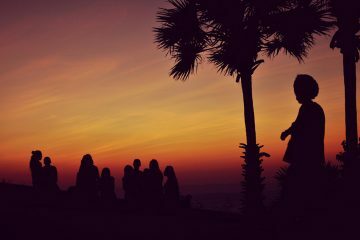 I love the place! Thanks for the comment, Lynda! We’ve only been to Mystic Grill twice because of crowds. But decided to try last night because my barber next door closed early to cut a home bound persons hair. We among everyone were greeted by the owner in a very welcoming way. We went plain and just got the bacon cheeseburger and split it. Omg I was so amazed at the taste and flavor. As good as I’ve had! The waiter was spot on but the young manager was constantly monitoring and checking on all customers. He seemed to be on top of all the staff for comfort and courteous to the customers. Glad I went back from over 7 months ago on such a special occasion. The owner and the manager made it where we want to make it a regular occasion! Impressive. Thanks for the comment William! Do you have to be 21+ to eat there? Not at all. 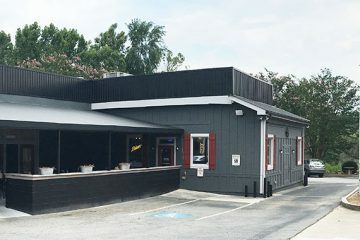 Its a family restaurant that does serve alcohol, but you don’t have to be 21+ to enter.